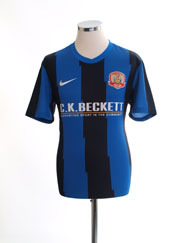 The Tykes were formed in 1887 and have worn red home shirts since 1901. The 1989-90 home shirt has always been cause for conversation due to it's rather radical design. The yellow away kit, made by Admiral, from the 2001-2 season prompted fans to adopt the chant "It's just like watching Brazil". Barnsley FC Blog | On The Ponty End http://www.onthepontyend.com	Dedicated to Barnsley FC and its fans. Documenting the ramblings of a BFC season ticket holder - On the Ponty End. Featuring news, fixtures, transfer rumours, readers articles, free podcasts, occasional rants and attempts at humour.